According to the Confédération Mondiale des Sports des Boules — the France-based umbrella organization for bowling games — bocce has been around since 9000 B.C. 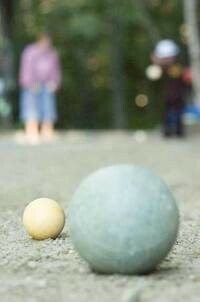 Archeologists excavated stone balls buried next to a teenager, leading bocce enthusiasts to believe the balls must have been used for a game. More concrete evidence comes from the Roman era, says the United States Bocce Federation. It holds that soldiers in the Punic Wars played games of bocce to relax between battles. That was until the early 1300s, when Holy Roman Emperor Charles IV declared the sport unfit for military men. Somewhere along the line, says the USBF, someone else decided that bocce was actually a good way to prevent rheumatism, and the bowling games — including the French variation of pétanque — began to spread around the world, especially throughout Europe. The USBF claims there are now about a million bocce players in the U.S.
At today’s Social, Maietta is watching while Cahill and fellow bocce booster Zander Ponzo go over the basics of the game. Each court is about 11 feet wide and 80 feet long. The first player rolls a small ball — called the jack, palliney, pallino, pig or boccino — at least halfway up the court. Then he or she rolls a larger ball toward the jack; players alternate and, in the end, someone scores one or more points for the balls closest to the jack. The gravelly-sandy-clay mixture might be consistent, but, as this Sunday-afternoon debut demonstrates, the rules are anything but. Ponzo and Cahill have prepared a handout about bocce — available at Oakledge’s parking kiosk — with help from Bosnian bocce player Dzenan Karabegovic and the USBF. As the founding forces behind the Burlington Bocce and Petanque Club, the trio worked with the National Italian American Foundation and the city’s department of Parks & Rec to build the courts, which cost about $5000. Oakledge was chosen over other Burlington parks because of its accessibility and defined green space. The club is helping to organize the first tournament for the Oakledge bocce courts for August 11 and lists rules on its handout. Maietta has brought his own laminated instruction sheet, along with a canvas bag of balls. And that’s another area of contention: Some sets come with four green and four red balls along with a white or yellow jack; others come with four sets of two balls in different colors. The cost for a set ranges from about $30 to $150. Maietta says he is excited about the courts, but he clearly disagrees with some of Ponzo’s instructions on the game, and worries about the sport’s fractionalization and sometimes loosey-goosey approach. Sini’s games, which culminate in an October tournament — the prize is a large, customized beer tankard — are as much about the food and drink as the bocce itself, says Cahan. “It’s like a soirée,” he suggests. Cahan stops talking to watch Johanna Greco take her turn on one of the Oakledge courts. She is 12 years old, the youngest at the Burlington Bocce Social. Unless you count the toddler wailing from the Westfalia in the adjacent parking lot. Rather than distracting the players, children simply add to the liveliness of the environment, along with the passing sailboats, bike riders and couples who wander up with towels around their waists after a swim. The courts here — which will be finalized, and probably a bit faster, once the final surface arrives in a few days — occupy a space with some privacy, picnic tables and trees, but enough visibility to attract newcomers. Greco, dressed in a pink T-shirt, capris and pink sandals, garners attention not for her age but for her provenance: Rome, Italy, which might also be the birthplace of bocce. She’s visiting her grandparents in Vermont. But Greco is unsure of her prospects on this sandy surface. “I play on the grass,” she explains. Her first ball comes within a foot of the jack, which is an excellent toss and draws cheers from the crowd. Elsewhere around the courts, Ponzo is answering questions about bocce, which may be poised to finally distinguish itself from other backyard leisure sports.